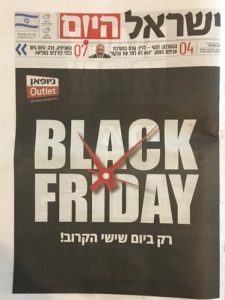 Black Friday is a big deal in Israel. Only the sales day isn’t tethered to Thanksgiving or Christmas, which makes it a little weird coming from America, where nationwide sales are attached to holidays, like President’s Day or Memorial Day. 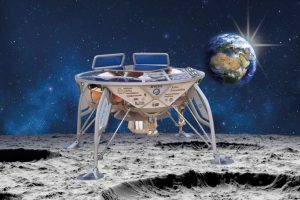 Black Friday in Israel is a sale without an excuse, a sale floating in space. Israelis don’t even bother translating the words into Hebrew or using Hebrew letters. Ads read “Black Friday” — Latin lettering and all. Israel Hayom, a daily giveaway newspaper, featured a particularly terrifying one on Nov. 21. At a distance, one would think the prime minister had been shot. The front page featured a black page with what looked like a gunshot in the middle of it. Only on closer inspection could one breathe a sigh of relief. It’s another reminder that English sells in Israel. Or at least the shops think so. In 2012, Dr. Benzi Nachman, an Israeli marketing professor, sent his students to inspect the signs at Israeli malls. 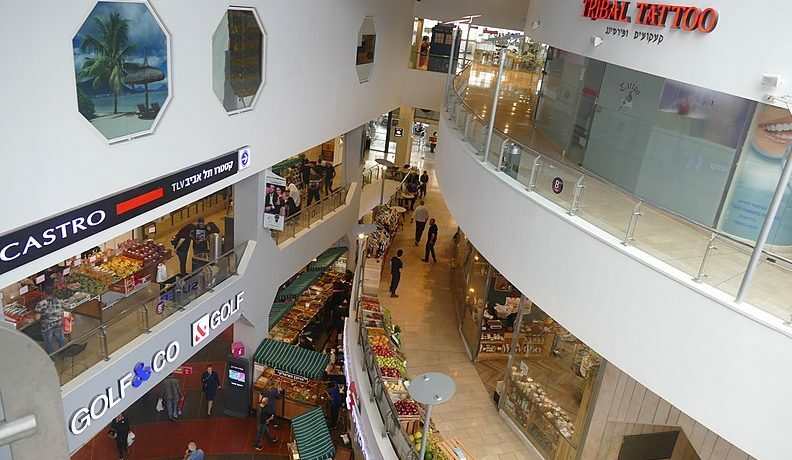 They found in the Ramat Aviv mall 79 percent of stores preferred English to Hebrew, even when the store was an Israeli chain with a Hebrew name. The women’s clothing chain Onot, for example, displayed its name in Latin letters only, despite the fact that it’s the Hebrew word for seasons. The students collected data on 2,141 stores around the country and found that 61 percent only featured foreign writing, even though many municipalities had laws on the books requiring that signs also be posted in Hebrew. Walking around the Israeli malls today nothing has changed. Dr. Nachman didn’t like what’s termed Heebrish, the mixture of Hebrew and English. 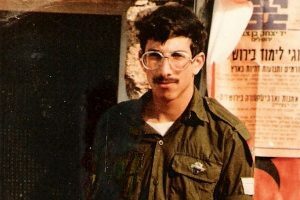 He told Israel’s Ynet news, “I think we live in a state that has a language, so we should use it. English invades the language and it’s impossible to stop that, but to establish a chain in Israel and all its lettering is in English, including its sale signs? Why can’t the signs be in Hebrew? 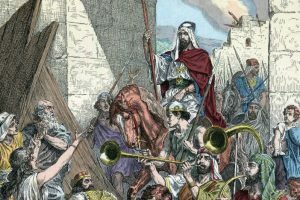 From a historical view, it’s ironic that English has taken over given the struggle, sacrifice and efforts made to revive Hebrew. When Tel Aviv was founded in 1909, all the signs were in Hebrew. In 1913, the War of the Languages, as it came to be known, was sparked by outrage when a newly established technical university, today the prestigious Technion in Haifa, announced it would adopt German for its classes. A well-orchestrated campaign put a stop to it and ensured Hebrew would be the language of instruction. In the 1920s, a language brigade was formed by students from Tel Aviv’s Herzliya Gymnasium, the first Hebrew high school in Israel. Called the Battalion for the Defense of the Language, it would break up gatherings held in Yiddish. Battalion members must be rolling in their graves. But hope is not lost. Things have a way of coming around again. In 2016, a rabbi in Bnei Barak told his parishioners not to shop at stores whose signs weren’t in Hebrew. He said better to buy from a store with Hebrew signs even if its products were more expensive. It will be fascinating to see if a reaction against English signs takes hold. Hopefully, it can be done without breaking any shop windows. Until then, here’s wishing you find some great deals.